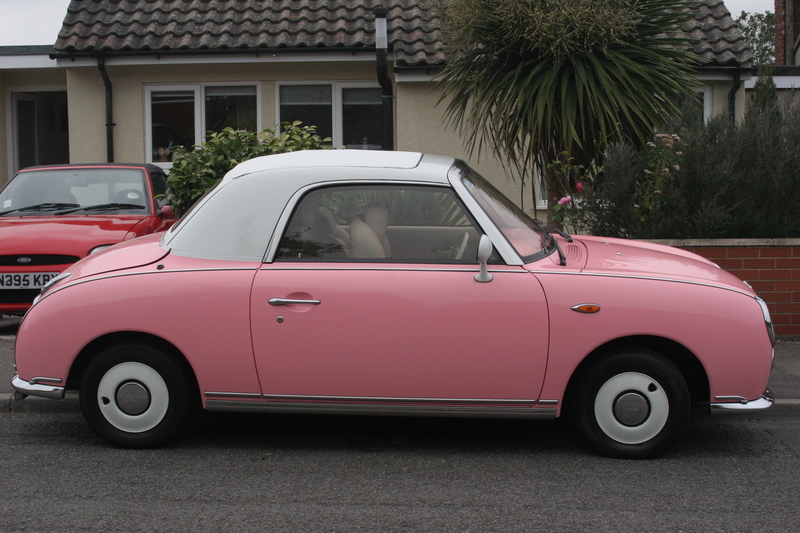 Last night after living in my garage for 18 months, my beautiful Nissan Figaro finally saw the light of day. As I drove it onto the driveway I felt sad that I will soon be saying goodbye to this wonderful car and the memories it holds. I haven’t driven it since the birth of my 3rd child, trying to manoeuvre 3 small children in a tiny 2 door car became too impractical. I now drive a car from the other extreme, a huge 7 seater Chrysler Grand Voyager, practical, luxurious but lacking the sentimentality and character of my beloved fig. The Fig represents a life lost, as I smelt the leather and heard the familiar heavy clunk of the doors, I remembered the days when I went out to work, driving without children with the roof down in the sunshine. Days when our then family of 3 would go out to the pub for lunch and watch as everyone stared at us, especially little girls). 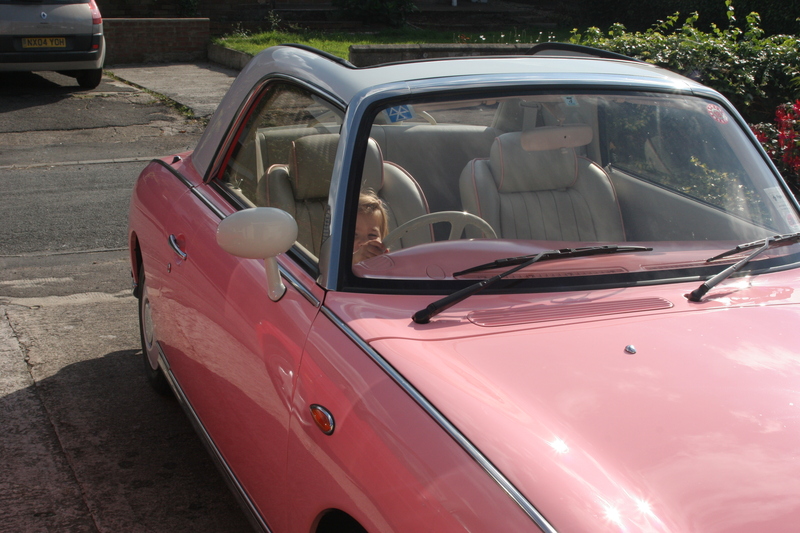 My daughter was the envy of the town as she went out with mummy in her pink car. Five years ago I was looking to replace my car and lots of discussion ensued. At the time we were trying for a second baby but after a few sad episodes it was uncertain whether this would actually happen. 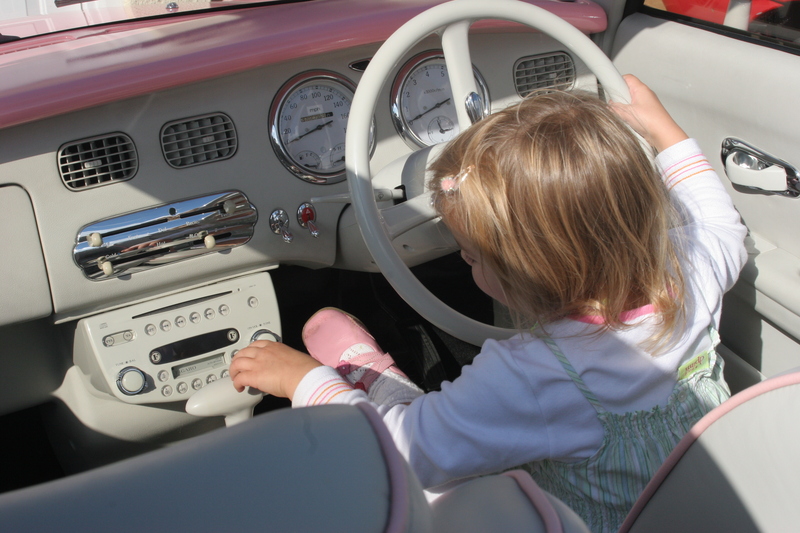 My previous car was a cabriolet and I loved driving with the roof down in the summer so we looked at various cabriolets with boot space big enough for a buggy. Then one evening my husband asked what car I would choose if I could have any car. This was easy, since seeing Figaros on the web I had fallen in love with their retro look and beautiful interior and the girly pink one was the one I coveted most. Acknowledging that we shouldn’t put our lives on hold, my husband suggested I stop being practical and just go for what I really wanted. I have to say I didn’t take much persuading. Figaros are imported into the UK from Japan where a limited number were produced in the early 1990’s for Nissan’s anniversary year. Mine was shipped to the UK and refurbished to a wonderful standard by Algy’s Autos. 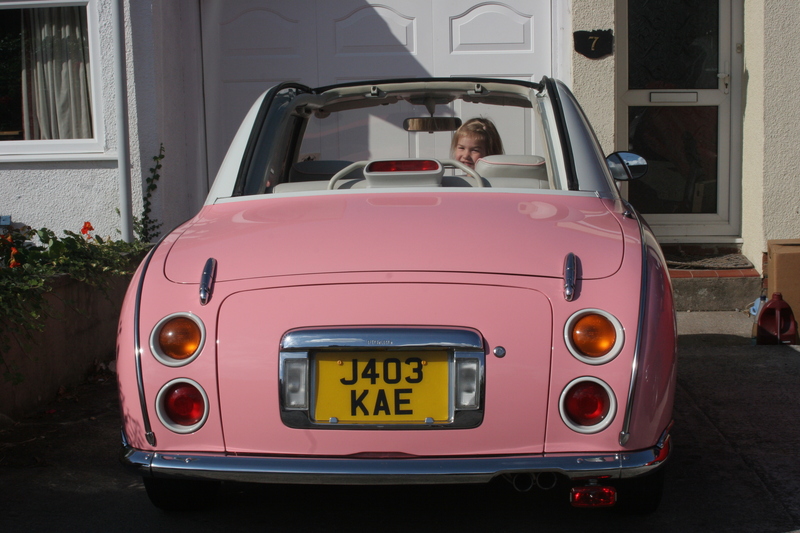 Pink isn’t an original colour but it was made to order with pink piping on the leather seats and pink interior. My Figaro is a 1991 model and comes with air conditioning, electric windows and cd player. Soon after collection, I fell pregnant with my 2nd daughter. It was a great pregnancy car because there is loads of space in the front, and being an automatic, with my short legs I don’t have to squash up to the wheel to reach the clutch. There was no way that I was going to trade in the Figaro for a bigger car, so I spent time researching buggies that would fit into the tiny boot. 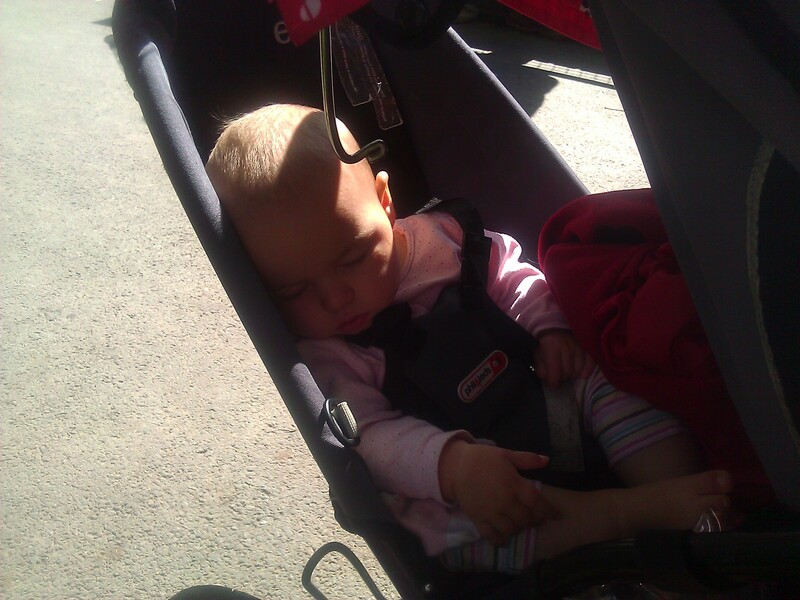 After trying pretty much every buggy Mothercare stocked I found the Quinny Zapp fitted in the top boot (the one that holds the roof when the top is open) and the frame could be used with a Maxi Cosi car seat to use from birth. From 6 months old the smallest Maclaren buggy, the Volo, fits in the tiny bottom boot allowing babies to be driven with the roof down (if they can cope with the wind). The car has 4 seats; the back seats are small and don’t have a lot of legroom but are big enough for children, car seats or short people like myself. A rear facing stage one car seat fits comfortably in the front passenger seat but can also fit in the back with a bit of manoeuvering. 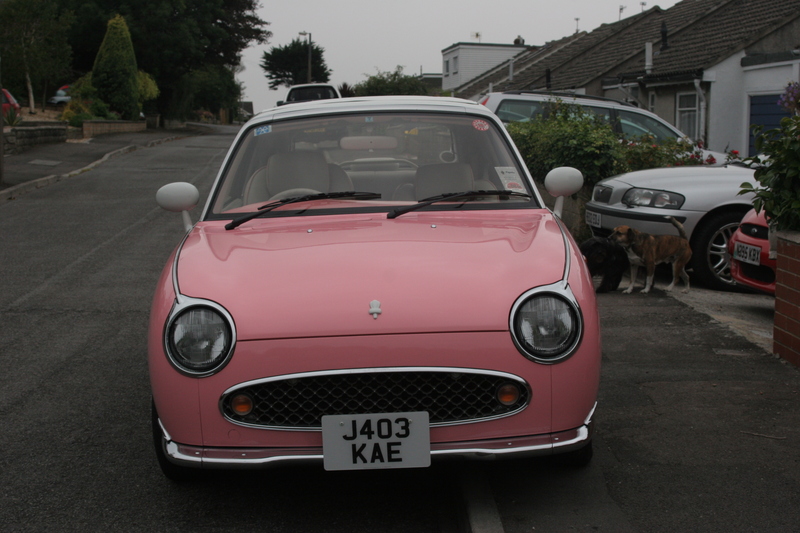 I love my Figaro but as we are moving overseas I am going to have to let it go. She has 48750 miles on the clock, has always been kept in a garage and has been wax-oiled underneath. As a 1 litre turbo automatic she is not for speed freaks but for style and fun she is difficult to beat. 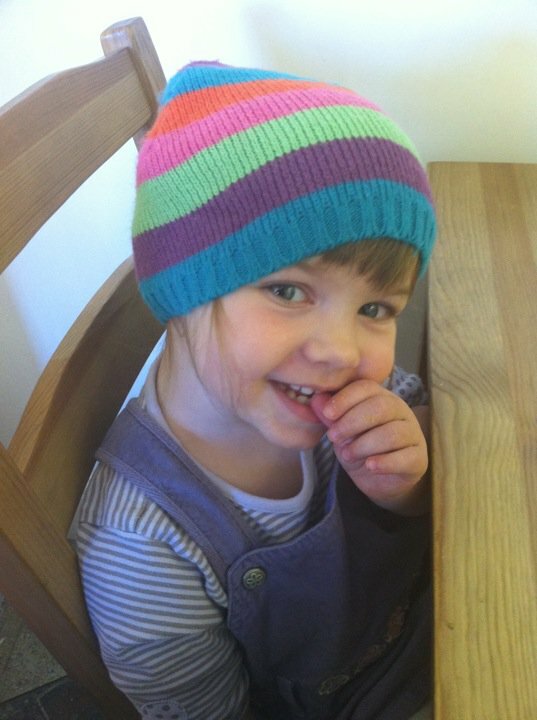 She is selling for a price of £7,000 ono. In the meantime I am going to get her back on the road and my girls and I are going to enjoy her for the short time we have left. Today we received a very welcome parcel from Baker Ross. Right From the Start has joined their blogger network, they send us lots of goodies and we come up with our own creative projects for using them. 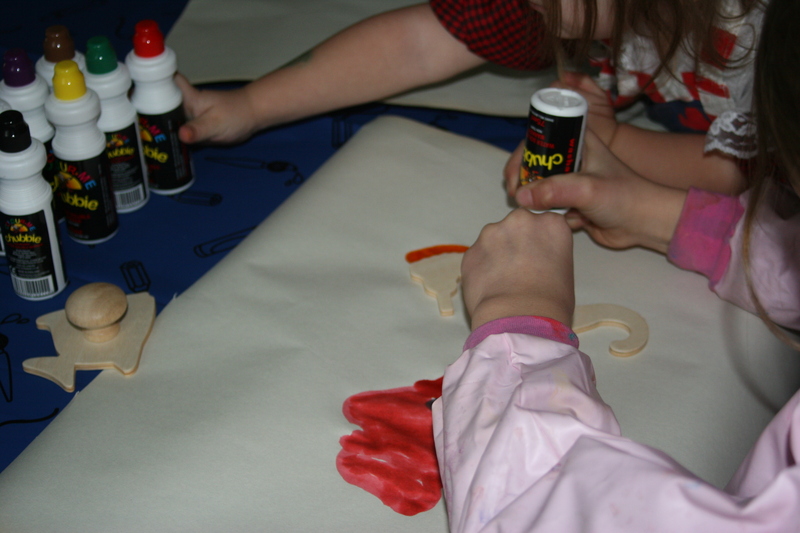 The theme of our first parcel is painting. We love painting. I paint when I find the time and find it very therapeutic. The girls also love to paint, in thesummer we paint outside .The girls enjoy painting on canvases and I display them in our hallway. 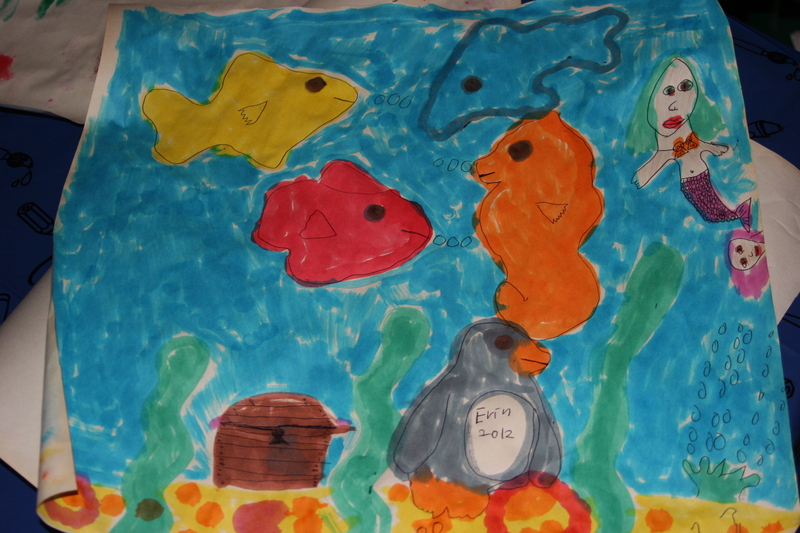 Today we went for the mess free option by trying out Colour Me Chubby Water Soluble Markers. These are perfect for small hands, dry really quickly and don’t make a mess. Even better they are washable, do not stain clothes and don’t dry out if you leave the lid off (although I didn’t tell the children this). 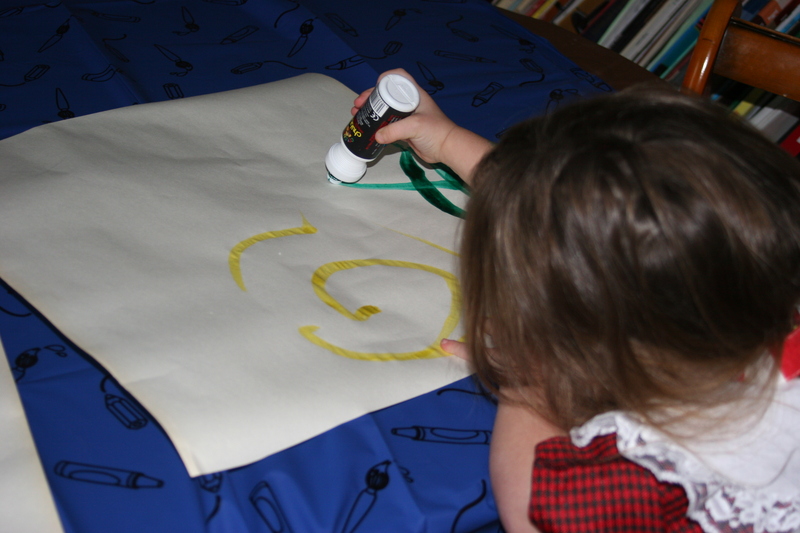 The markers are great for an early mark making tool on large pieces of paper, they are sturdy and the paint comes out easily. My 7 Year old decided to try them with the wooden sea stencils. These are great for little hands as they have large, chunky handles, meaning that they are easy to hold in place with one hand whilst drawing around them with the other. This non-messy option was good for the baby too. 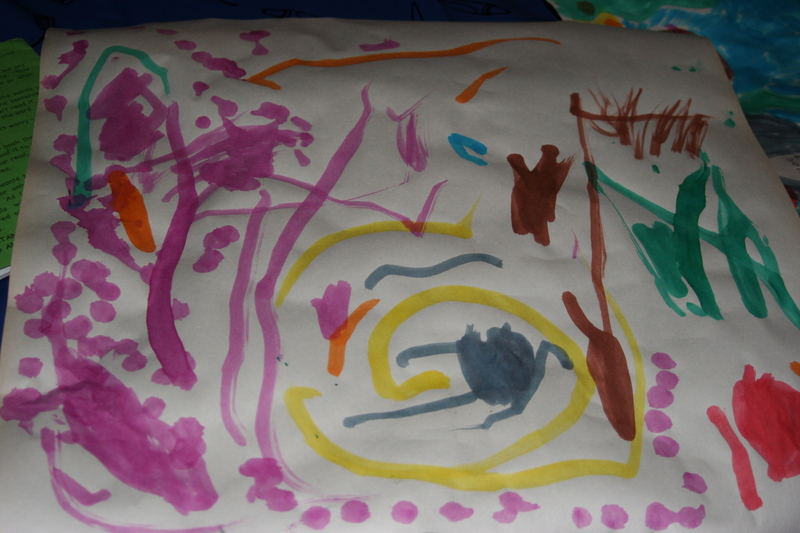 We did our painting on the floor so that she could move more freely. 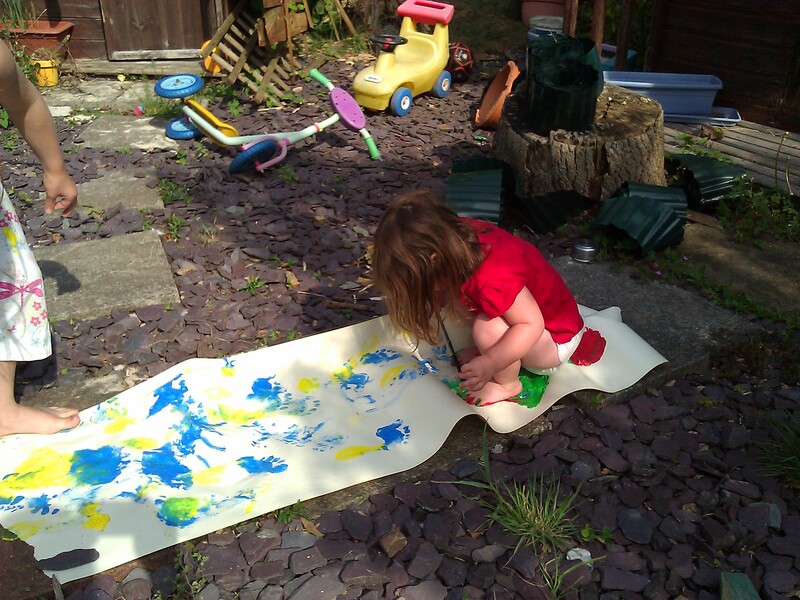 She loved playing with the lids, taking them on and off and enjoyed painting on the paper although it was sometimes difficult to get them upright enough to make a mark. She decided as all babies do that it would be a good idea to see what the paints tasted like. 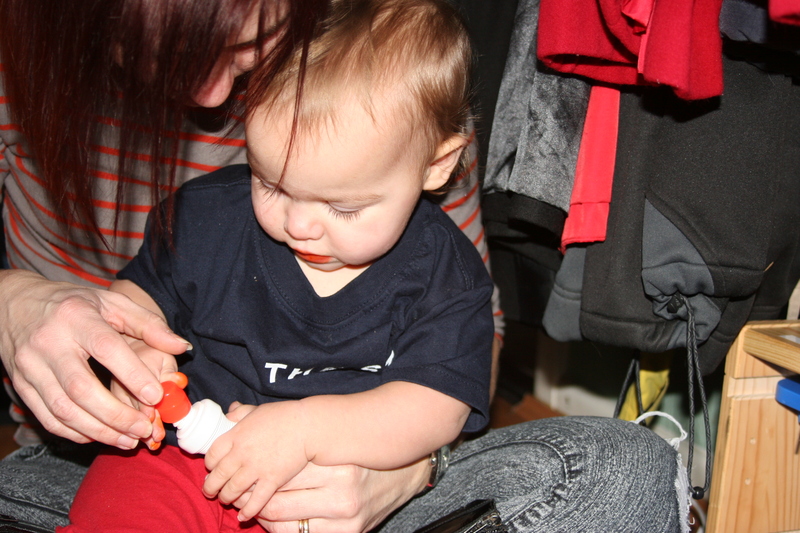 However, as they are fully washable and non-toxic I didn’t need to worry – a quick wipe removed the orange lipstick. I was really impressed with the results and when we have limited time and I can’t face the mess involved with painting this is a great alternative. Some time ago I was asked to review ‘Your Baby Can Read’, a system for teaching babies from 3 months old to read. 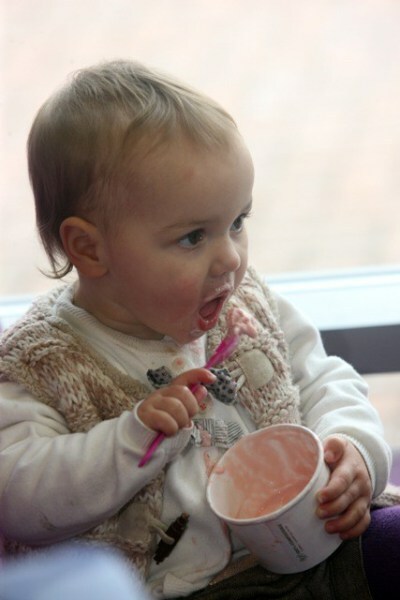 The system aims to introduce the written word at the same time as a baby is developing a verbal vocabulary. As today is International Literacy Day I felt I should bite the bullet and go for it. So why the procrastination? My initial thoughts were that such a system goes against my beliefs. I have seen many parents who focus far too early on reading and writing and become both stressed and competitive about it. A baby has so much to learn in the first years is it really necessary that we add reading to the list? I also feel that a lot of the time a focus on learning to read and write means that many of the underpinning skills necessary to achieve this are overlooked. 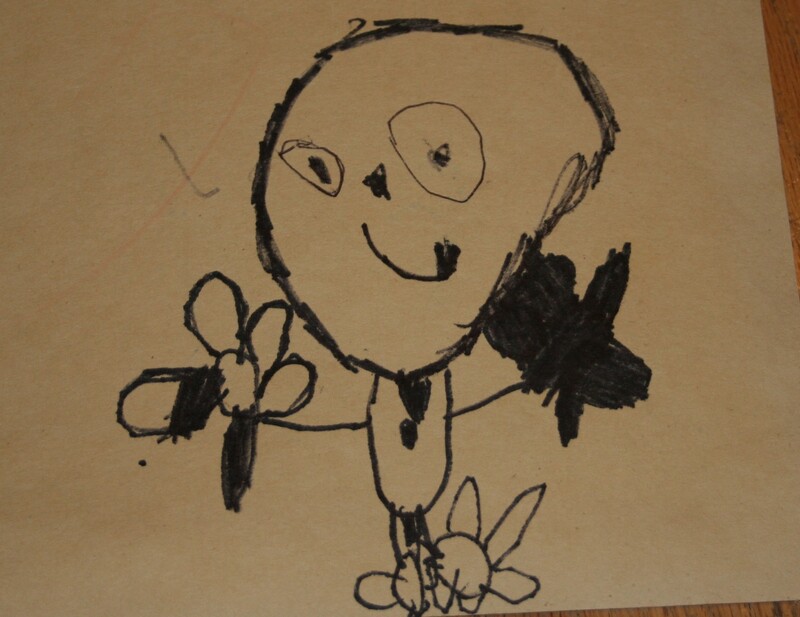 However, I felt that it was important that such products are reviewed by someone with an early education background. I was interested in seeing the products to help make an informed view. 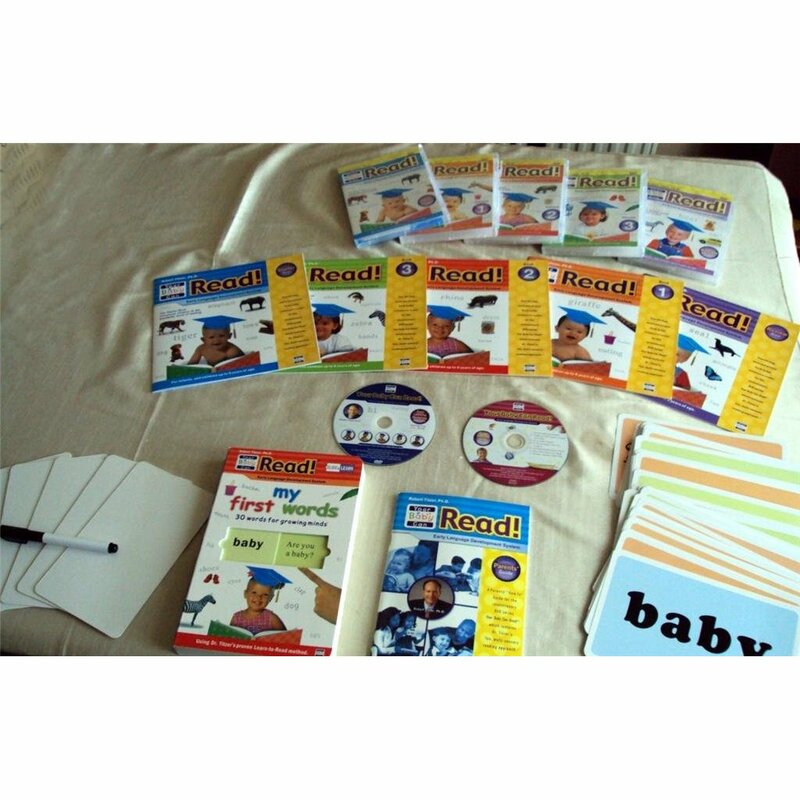 The materials in the programme include 5 DVD’s, 5 lift the flap books, 5 sets of sliding word cards, music cd, 82 double-sided word cards, a sliding windows board book, word game cards, a parent’s guide and early learning workshop DVD. To be honest, I liked the materials more than I thought I would. My biggest reservation about the whole programme is that reading is taught through DVD’s. There is a firm emphasis on how interactive the DVD’s are but there is no requirement to sit with your baby as you watch them. I watched the DVD’s with my 10 month old and 2 year old, the 2 year old was mildly interested and the 10 month old paid no attention at all. Personally I don’t see that there is anything that the children can learn from the DVD’s that they couldn’t learn from sharing the books with an adult. I may be wrong, but I feel that this is an easy way for parents to avoid feeling guilty for not spending time with their children. The DVD’s themselves are watchable and encourage the children to interact. It is unfortunate in my opinion that they are American, I think some of the pronunciation of words may be difficult for young British children when listening to American accents and some words like colour use the American spelling. I feel to transfer the programme to a UK market it would be beneficial if the DVD’s were remade with British accents and spelling. I really like the lift the flap books. These have the word printed on the flap and when the flap is lifted there is a photograph to illustrate it and a number of interactive questions and instructions eg. How many dogs are there? Point to your elbow and What is your favourite thing to eat? My 2 year old particularly liked these and enjoyed focusing on the words, pointing to them and ‘reading’ them with me. I can imagine that with her interest in books and the written word, having read them a number of times she will begin to read the words in the books. The same words are used in the sliding word and picture cards and word cards (flashcards). The word game cards have 2 of each word so that you can play matching pairs games with the words. I can imagine my 2 year old enjoying this, although I haven’t tried it yet. The programme suggests that you begin by reading the parents’ guide and watching the early learning workshop DVD. The parents’ guide explains how to use the books with your child and gives practical ideas for sharing other literacy related activities with your child. I thought the DVD was excellent, with a lot of sound advice about early language acquisition and literacy. My worry is that it is very long and I wonder how many parents would actually sit through it before embarking on the programme. Dr Robert Titzer the creator of the programme begins by explaining how the programme originated. He explains that he created the DVD’s to occupy his baby daughter in those times when she was ‘doing nothing’ while he was making dinner or reading the paper. I found this a strange choice of phrase – I don’t think I have ever seen a baby ‘doing nothing’. He also talks about early brain development and the rapidity of brain development in the first few years of life. This is a perfect reason for interacting with babies, but I’m not sure it is a justification for the need to read at this age. Having said that there are a number of very positive points about babies and learning that Dr Titzer makes. 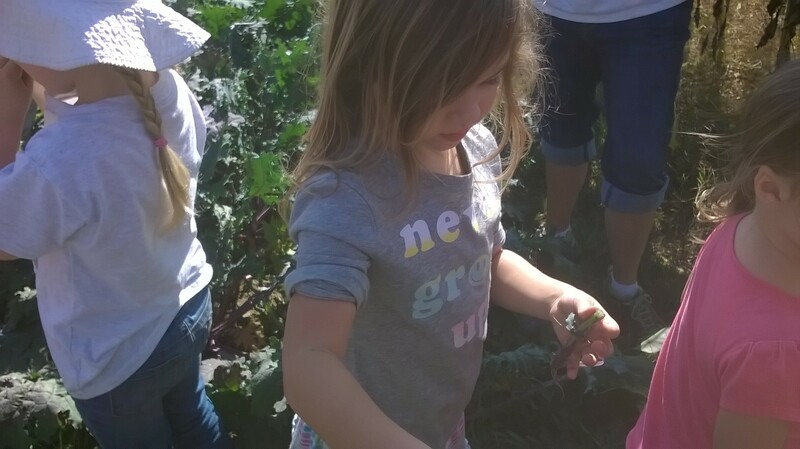 Children have receptive language (the ability to understand the meaning of words) before they can speak. Talk to your baby, talking about what they are interested in. 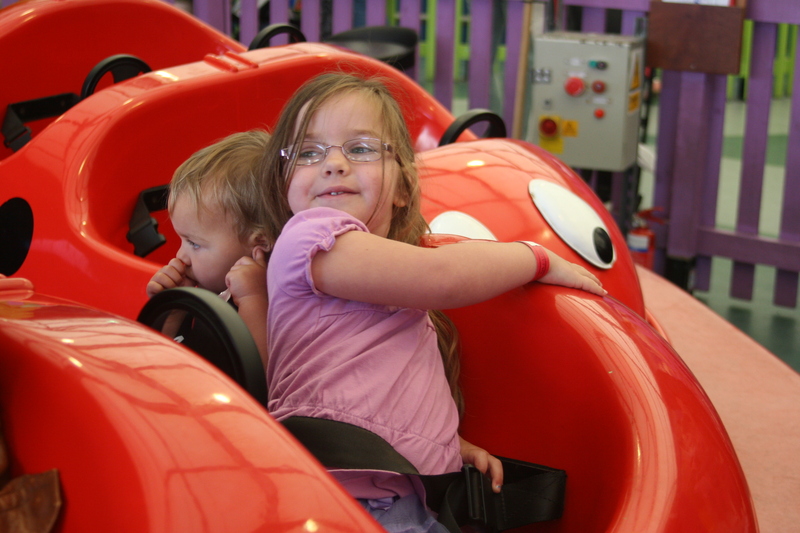 Play games with babies in the mirror and follow their lead building on the things they instinctively do. Don’t let children watch too much television, it is far better to read with them. Children are ready to write when they can master the physical skills – there is no particular age at which this will happen and it should not be introduced too soon. The children in the case studies shown on the DVD have clearly learned to read both individual words and whole books. They enjoy reading, are happy and engaged. I have no doubt that the programme works but I question the appropriateness of teaching young babies to read. The main argument for teaching babies to read is that the earlier a child learns to read, the more educational advantages they will have later. There is a wealth of research that shows that the size of a child’s vocabulary at the age of 3 is the biggest predictor of how easily they will learn to read . The programme encourages the development of vocabulary through the introduction of 164 key words. It gives opportunities to introduce other words related to the children’s interests, by providing blank cards and a wipe clean marker pen. However, surely it would be as beneficial to focus on spoken language and oral/aural skills (such as rhyme, identifying sounds, alliteration) in the first 3 years, accompanied with fostering a love of books, story, song and rhyme? Dr Titzer explains that the earlier a child learns to read then the more likely they are to love it. From personal experience with my own children I disagree with this. My 2 year old has been obsessed with books since she was around 6 months old but cannot read yet. At almost 3 she is beginning to show an interest in words and is keen to read some for herself. My 7 year old went to school without being able to read but with a huge vocabulary, an interest in books, the ability to recognise rhyme and alliteration, a love of singing and poetry, the ability to keep a steady beat and some knowledge of the alphabet. Within weeks of being in school she learned to read, she is now a well above average reader, an avid bookworm and reads aloud with more expression than most adults (including myself). Based on my 2 year old’s extensive vocabulary, love of books and ability to recognise rhyme I expect her to go the same way. From this experience I question the necessity of programmes such as ‘Your Baby Can Read’. I think if you have a pre-school child who has built a good vocabulary, oral and aural skills, loves books and is showing an interest in the written word then this could be a useful tool in the journey to learning to read. Personally I don’t like the idea of teaching reading using DVD’s because reading is as much about sharing a special time and ideas with your child as it is about the act of decoding words. I will use the rest of the materials with my 2 year old daughter if she shows an interest but I wouldn’t choose to use them with my baby. For those who would like their baby to read I have no doubt that the system works and that if the system is followed according to the comprehensive guidance the babies and toddlers will get great pleasure from it. From the perspective of an early educator, I would let babies be babies and use it when the children are a little older.